If you're a regular reader of io9, you know they think arduinos (little open-sourced micro-controllers that do amazing things) are pretty cool. But even if you're not an electronics guru, arduinos combine pure kiddy fun with grown-up challenge. This course provides a nice intro, and for io9 readers it's just $19. Basically, an Arduino is a programmable little computer that can control real-world stuff — they have been used to power everything from DIY Etch-A-Sketch laptops to firefighting robotic dragons. There's endless fun to be had once you know what you're doing, and this course is designed to make the learning curve a bit gentler. Teaching from the first baby steps, electrical engineer Dr. Peter Dalmaris walks you through setting up your Arduino, learning to program it, and give an understanding how micro-controllers work. 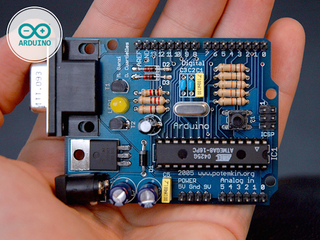 All you need to start is the Arduino itself. Purchasing this deal gets you unlimited, lifetime access to the course, and it comes with a 30-day money back guarantee, so it's risk-free.